New campaign of the month is here, and a new comic so check them out! 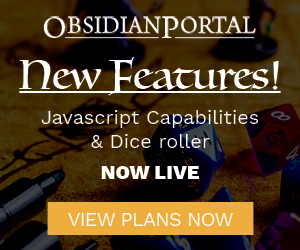 A big announcement over at Paizo recently shocked the RPG masses with their announcement of creating a Pathfinder MMORPG. The project is very early in development and appears to be by a company by the name of Goblinworks which is also headed by Paizo folk as well. No release date yet, so check the FAQ. Micah and I discuss and keep our fingers crossed for them!